January 4 – January 7. Sunset as seen from Norman’s Cay. 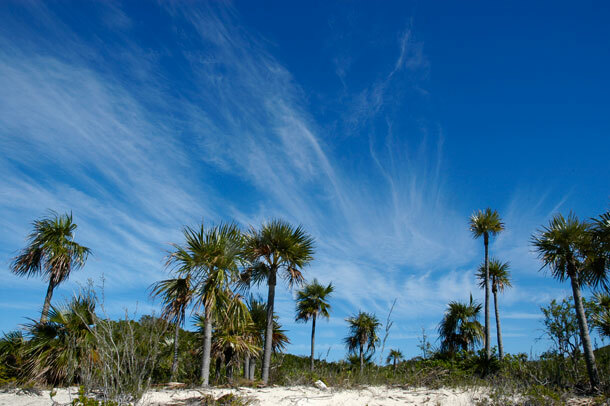 There is a nice inviting sign with a palm tree and a sun surrounded by bright conch shells just off the airstrip at Norman’s Cay. One might think they had just landed in a lively Bahamian getaway. 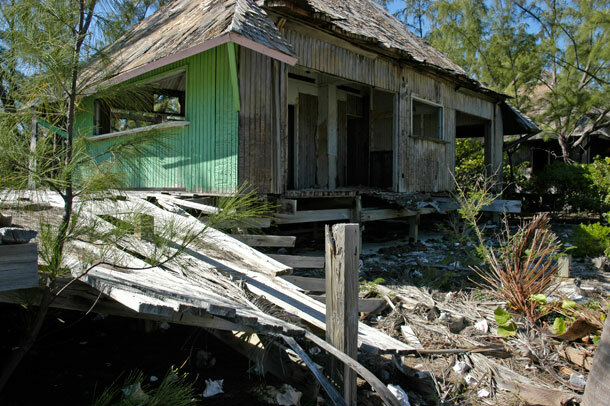 Unfortunately, despite wonderful scenic beauty and a few nice houses we only saw from a distance, Norman’s Cay is a story of failed criminals and abandonment. The only bar was closed and most of the rental cottages seemed to be undergoing renovations. But we didn’t come for the sunsets and cocktails, anyways. We came to see the plane. 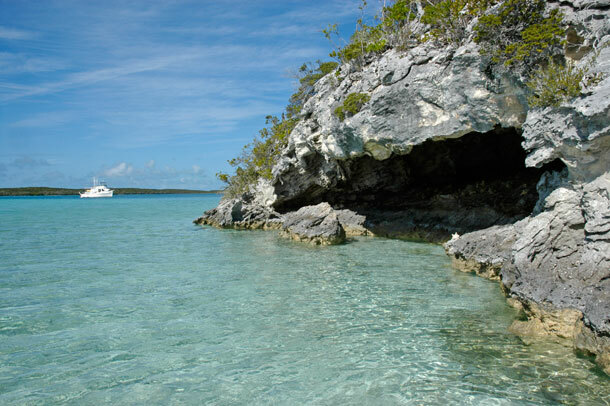 In the ’70s and ’80s Norman’s Cay was used as a base for a cocaine smuggling business lead by Carlos Lehder. A DEA task force took steps to close down the operation and Lehder fled to Colombia where he was eventually caught and extradited to the US. 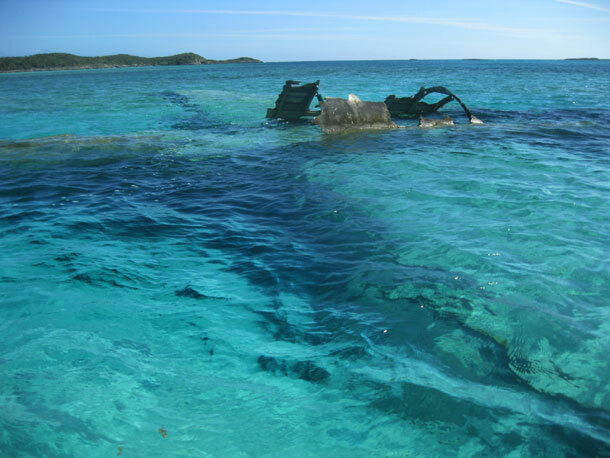 A remnant of those days lies in the shallow waters off the cay, a slowly decaying, ill-fated drug smuggling plane. 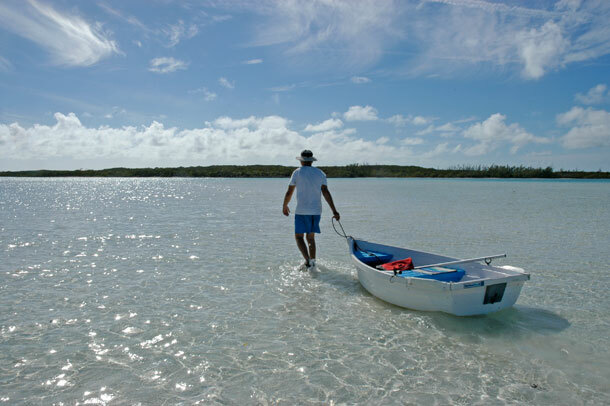 We spent three days at Norman’s Cay. During that time we explored, did chores, and spent a few happy hours with sailors Judy and Steve. Judy and Steve once sailed a Catalina 36 similar to Blue Wing. They upgraded to their new boat after their Catalina came to catastrophic end. 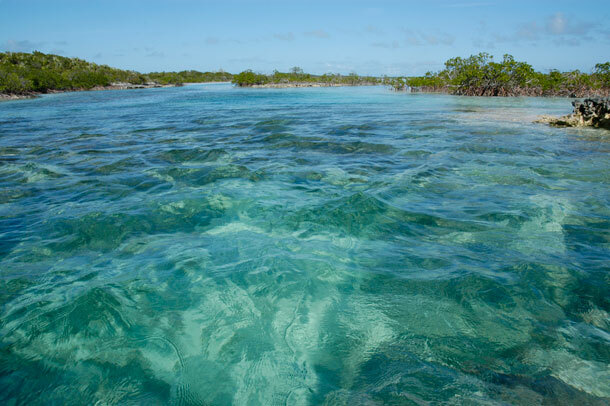 At the end of a 40-hour journey, riding 20-foot waves, their old boat found its self impaled on an ancient coral reef off the coast of Mayaguana Island in the southern Bahamas. Flooded and damaged beyond repair some sailing friends anchored nearby took them in as well as everything they could salvage off the fateful sloop. On return to the United States, Judy and Steve found themselves homeless, so they decided to buy another boat. Personally, I think an experience like that would have endeared me to the dirt, but Judy and Steve seemed to be happy and comfortable in their new home, and perhaps just a bit more cautious. On notice of impending bad weather they were ready to get ahead of the high wind and move to a more protected location. Our first morning at Norman’s Cay we rose early and moved Blue Wing south of the island and anchored along the channel leading to Exuma Sound. This shortened our distance to row to see the plane and explore the interior of the U-shaped Cay and the harbor known as Norman’s Pond. There was much more substance to this plane in the picture in our 16 year old guide book. It seems to be slowly becoming part of the seabed. We rowed through mangroves on our way to see the caves at Norman’s Pond. 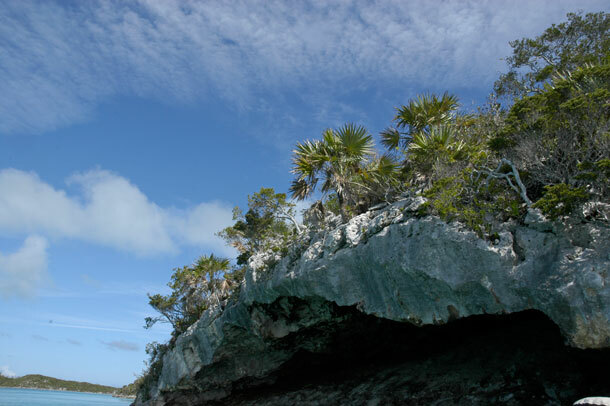 Cave, palm trees and sky off of Norman’s Pond. We met Dennis burning trash at the Pond-R-Osa off of Norman’s Pond. Dennis, his wife Gail, and dog Bentley live in a trawler and spend a good deal of time in well protected anchorage at the pond. Sky and palms off of Norman’s Pond. Another cave on Norman’s Pond. Dennis’ trawler is in the background. The pond is a good anchorage for shallow draft trawlers. The entrance to the harbor seems a bit low in water depth for Blue Wing, although Dennis assured us that we could get through at high tide. Perhaps some day we will try it. The row back to the boat was a bit challenging. Dragging Fever through shallow water was nothing compared to arduous row back across the increasingly stronger current of the channel. 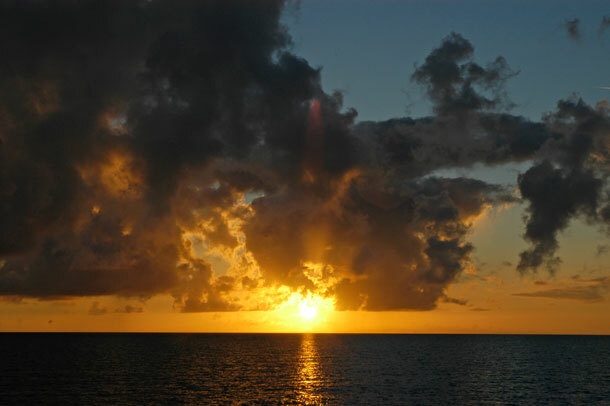 Once we were aboard Blue Wing again we moved back to the calmer west side of the cay. 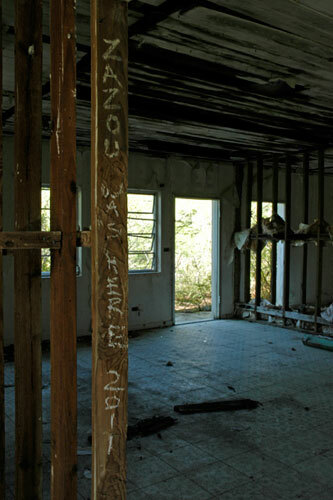 Sailors leave their happy mark on this home, perhaps an abandoned dream in these uncertain times. These cottages were build with cardboard and plywood. 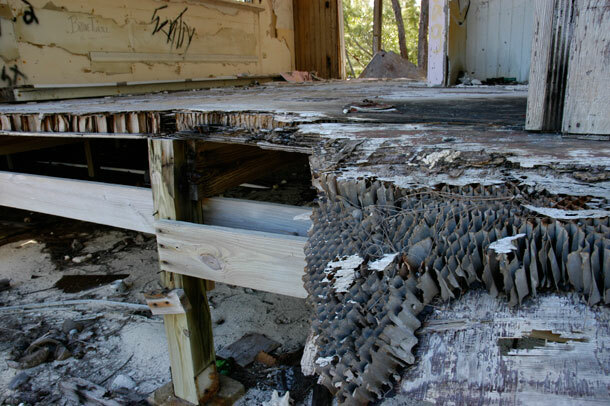 I wonder if this was an economical choice or if there was some environmental or structural reason for using these materials. 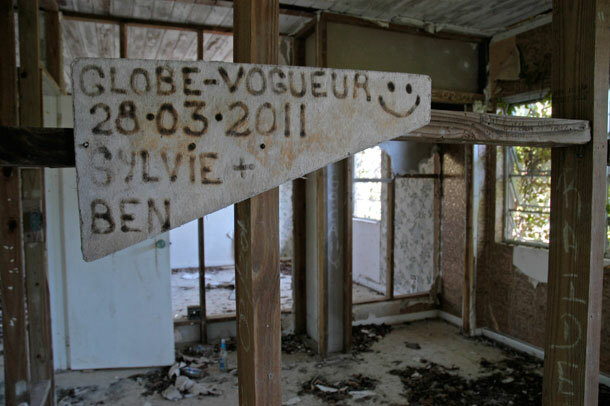 According to our guide book, the plane and a few bullet holes in some of the buildings are all that remains of Normans Cay’s drug smuggling days. 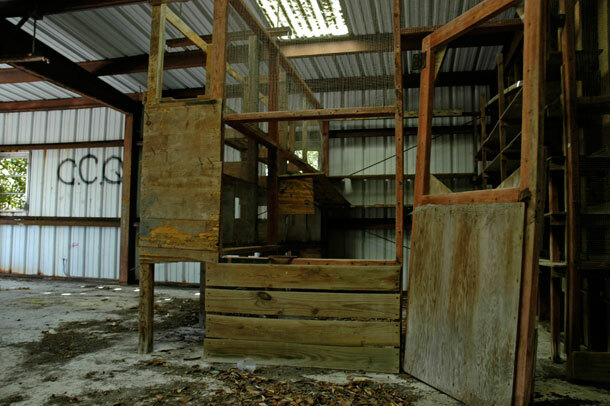 We didn’t find any bullet holes in this building, but it seemed like the kind of place for nefarious activities. 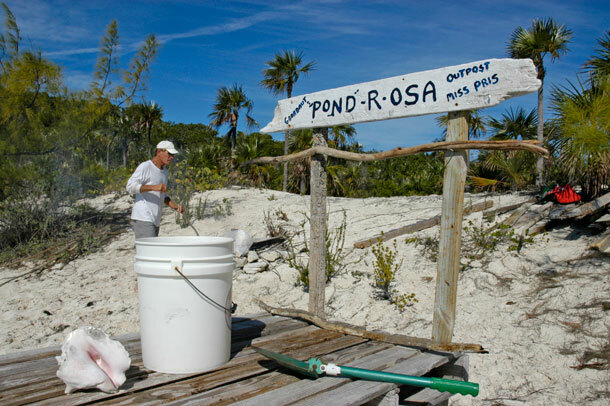 The hopeful sign off the airstrip at Norman’s Cay. Reading your adventure and seeing the fabulous pictures while looking out my ATL window to torrential thunderstorms and tornado warnings! Thanks for the warmth you provided. Safe travels. Hi, well, where to begin. The plane in the water is a C-46,not a DC-3 as stated elsewhere. It landed there on a Sunday. Charlie brought it over to carry Bahamian workers back and forth to Nassau, because there was no place to house them. In a practice landing with the new pilot, he touched the left wheel before the pavement began, and snapped it off at the spindle. They flew round and round, as the wheel flapping busted the oil line and stopped the engine above it. They called Rock Sound to land there, and were refused permission. As the other engine began smoking badly, they landed in the shallow water. I took them off the plane. I was Joe Lehders neighbor and friend. If you’d like to know more, just ask. So, Joe bought Units 1 and 5 of the island. One was the airport, the other the Exuma Sound side, with several houses. The one with the big chimney we called Volcano. Joe lived there first, but later he built a home further South, which he named “Florida.” That way, when the DEA came around, we could say Joe Lehder was in Florida and we’d be telling the truth. After Joe bought the island units, one which included the airstrip, not much of any illegal stuff went on there. That’s because it wasn’t good to sh— where you lived. But, a couple of the residents tried to continue their bad habits there, and Joe had to barricade the runway. Over the years, the stories got embellished, but what you read here is true. So, one more comment from Jerry, Gerald, Blackfin. The site won’t let me use the same name for duplicate comments……Anyway, so, when Joe was apprehended, Robert Merkle, the federal prosecutor, set up a Norman’s Cay task force to prove a case against Joe, located in the basement of the Jacksonville Florida Post Office, and the homeowners were all subpoenaed, because they now had the culprit, and needed witnesses. I was subpoenaed and Merkle was very forceful. He wanted a witness, but there was nothing to witness. He threatened me with perjury. I asked him if Roy and Dodie Dillon had said anything different than I. He said he asked questions, not answered them. I told him I’d take that as a “yes” and if he wanted to arrest me for perjury, he could do so right then. The Dillons owned a home on Norman’s. Roy Dillon was retired CEntral Intelligence Agency. Robert Merkle said he had no further questions, and that they’d pay me for my travel and time. I told him to keep it, and walked out. OK, one more comment from Jerry….So, how did Norman’s and Joe get the bad rap? Well Joe was a trafficker, but the traffic went elsewhere to islands close by. But he got the rap on Norman’s, when Senator Ted Kennedy landed there with the speaker of the house, to play tennis. The tennis court was located midway from the airstrip to the hotel. Joe met Kennedy, at the airport, and told him he couldn’t play tennis, because he himself owned the airstrip end of the island. But Kennedy insisted, and was very arrogant, walking towards the tennis court where he had been before. Joe was walking alongside him and saying that the Senator didn’t understand, and when the Senator turned towards the tennis courts, he understood. The fenced in courts were now used to house the goats. So, a week later, the DEA raided Norman’s for the first time, and thereafter, as a courtesy, and for tips, the Bahamian authorities would call when a raid was to come. We heard they said we were heavily armed, and it is true that we were heavily armed with a sense of humor. 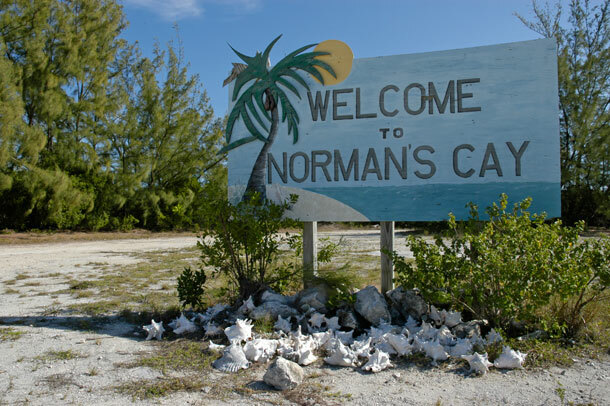 I hope you have enjoyed reading a bit about the Norman’s Cay I knew. Thanks for the history lesson Jerry! I did enjoy it! It must have been a time living in the Bahamas in those days!